Winning any kind of award or prize is always wonderful for any writer. For a moment, just for a moment, your internal critic has to slouch off to a corner and sulk while you enjoy the thought that someone who doesn’t know you likes your writing enough, believes in you as a writer enough, to pick you out from amongst a field of other talented writers. You get to meet a host of lovely people – in my case the team from New Writing North – who are committed to developing writers and who genuinely share in your joy. You get to go to an awards evening, where you meet a crowd of other good people, many of whom are dazed and disbelieving – but happy – prize-winners too. That’s all great. But the best kind of prizes are also transformational. In early summer this year, I got an email from New Writing North telling me that I’d won the Arvon Award in the 2018 Northern Writers’ Awards. I read it a few times looking to see how and where I could possibly have misread it, but no, it actually said what it said, and there was no follow-up email to say, ‘Sorry, terrible typo, left out the not’, so after a while I had no option other than to believe it. 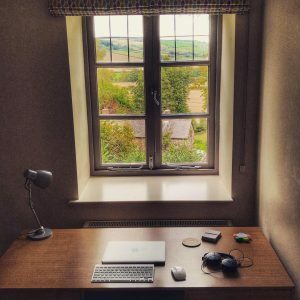 My submission had been explicit about my intention should I win the Arvon award: the thing I have least of is time, and I wrote that if I won I’d use the prize to take a week’s retreat at an Arvon centre, to push on a very necessary rewrite of much of my novel. All of which is how I found myself driving five hours from Sunderland down to rural Shropshire this October. I was on my way to the beautiful surroundings of Arvon’s centre The Hurst, playwright John Osborne’s old house set in the middle of 60 acres of forest. 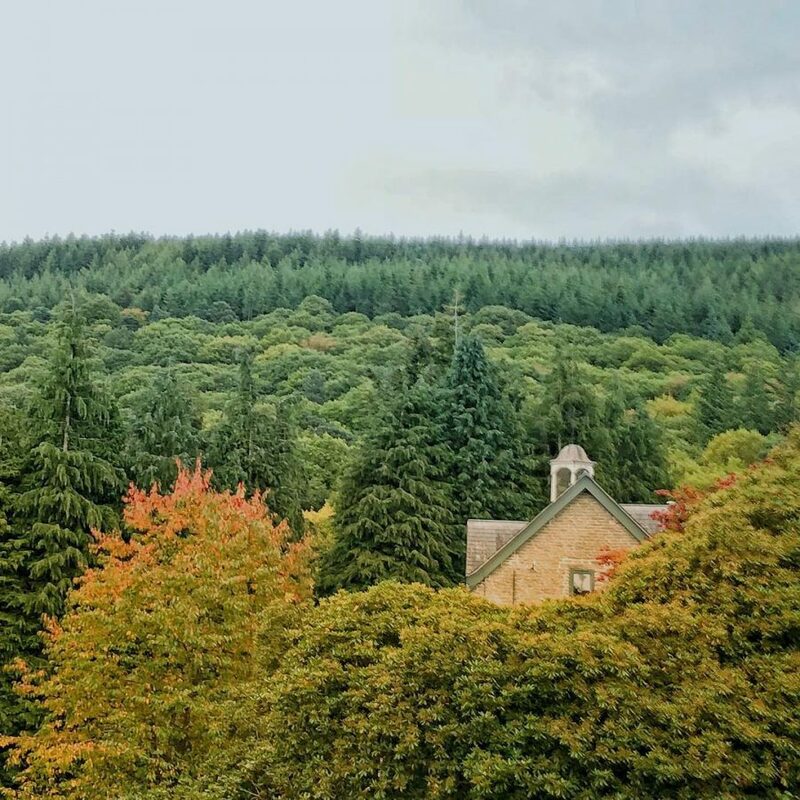 The Hurst itself is one of the centres where Arvon’s many excellent courses take place, but there is a neighbouring building called The Clock House which has been converted into four flats specifically for writers on retreat. There’s a shared kitchen/dining room/living area, but each flat has a study with a desk (and the most comfortable chair I’ve ever sat in), a place to sit down uninterrupted and get to work. Within a day I’d found my routine. Up early, breakfast outside in the cool autumn air listening to the trees whisper to one another and watching a squirrel run up and down a telephone line as if it were auditioning for Mission Impossible. Hit the desk, write, write, coffee, write, write, lunch. Hour or so walk through the woods, because it was good for the heart and the mind and the back, air so still and woods so quiet that all you could hear was the sound of leaves falling to the forest floor. Then on the afternoon, more writing and plot thinking, until at half-seven the four of us in the house would meet up, eat and drink wine and talk about how we’d got on that day, and about writing and our lives. Repeat, each day. Watch the word count rise in a way it never had before. I was very lucky to have three such terrific and talented retreat-mates. All were intent on making the most of their time on retreat, of working through the day, so we didn’t distract each other. But evening was our time to share experiences and encouragement and advice, and it was a pleasure and a privilege to spend that time with them. I learned a lot from them all, and am very excited about seeing their continued success in the months and years ahead. I’m very grateful to New Writing North for running the Awards, and to Ruth Borthwick, Chief Exec of Arvon for choosing my entry out of all the others, and for giving me this wonderful opportunity through her organisation. As well as progressing my novel further than I thought I ever could in just a week, the award and the week away has done something else equally important: in the middle of a busy life, with family and day job and lots of other things going on, it’s reminded me I’m a writer. I’ve kept that thought and the momentum from the week long after I’ve come back into the real world, and it has changed the way I engage with my writing now. If you’re entering the Northern Writers’ Awards this year, good luck. If you’re not…think about changing your mind. Like I said, the best kind of prizes are transformational. The Northern Writers’ Awards are now open for submissions. Find out more and apply here.